For a brief period of time, from 1992-94, I had the gold fever and was searching in the Siskiyou’s with a couple of buddies. We spent a lot of time at the BLM office pouring over old records of mines. Some were still active, but most had reverted back to the state. Long story short…never found enough to make our efforts worthwhile. I recall one day when the three of us went to the Siskiyou County Court House and saw a fabulous display of gold nuggets in the lobby behind a glass case. It was March, 1851 and gold had recently been discovered about 30 miles south of here on the Scott River. A group of six men... while striking camp the next morning, Thompson observed something extraordinary. Because of heavy rains the ground was soaked, and the bunch grass, serving as breakfast for the pack mules, was being pulled out of the ground, exposing the roots. And on those roots, Thompson noticed, were flecks of gold. He and his men decided to stay. Unbeknownst to Thompson, he had just spent the night on what would soon become known as “the richest square mile on earth.” As well, his accidental discovery set in motion the creation of a new town. With so many gold-seekers already in California due to the ’49 gold rush, it wasn’t long before word got out, and within six weeks of Thompson’s discovery there were 2000 miners on Yreka flats. In those early days it was known simply as Thompson’s Dry Diggings, and was basically a huge camp full of transient gold miners. By August of that year, as the miners discovered that this area was the “second mother lode,” the population swelled to 5,000. At that time, the town, now called Shasta Butte City, moved to its present location, in order to be closer to the nearest water supply (Yreka Creek). Slowly but surely, the new town was taking shape, and the first real structures were going up on Main Street (today’s Miner Street). In early 1852, with the population continuing to grow, the State Legislature created Siskiyou County. At that time, because there was another town called Shasta in the region, Shasta Butte City changed names again, this time choosing the local Indian word for Mt. Shasta—Yreka. from "The Boomtown That Didn't Go Bust--A History of Early Yreka"
However, Barter was unsuccessful in his quest for gold and soon decided to turn to a life of crime. ... 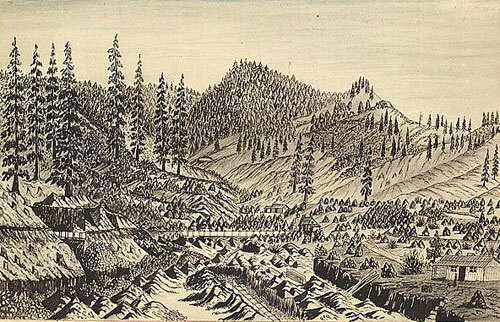 In 1856, Barter learned from a drunken mining engineer that large gold shipments were being sent down Trinity Mountain from the Yreka and Klamath River Mines. Barter sent George Skinner and three others to intercept the gold shipment, which was packed on mules. George and the other bandits stopped the mule train outside of Nevada City, California holding guns on the muleskinners. Meekly the men turned over $80,600 in gold bullion to Skinner and his men, without a shot being fired. The bandits then made off with the shipment to keep a rendezvous at Folsom with Barter and Cy Skinner. However, George Skinner found it next to impossible to take the heavy gold shipment down the mountain passes without fresh mules. Soon, he split up the gold shipment burying half of it in the mountains. The treasure has never been recovered and is said to be somewhere on the slope of Trinity Mountain, said to have been buried about 12 miles south of the hold up point.